Why make a musical connection? Part of growing up is establishing your musical taste. You find the songs, artists, lyrics, and sounds that speak to you and absorb them into your sense of self. For teenagers, this definition of self is in a state of rapid growth and change and thus so are their musical preferences. What this means, is that by creatively tapping into a teenager’s evolving musical tastes, you can tap into their evolving emotions and personality. By taking things a step further, you can offer some insights into how music has shaped your life and create a potential bridge for conversation and connection. With the rise of digital media platforms, there are lots of channels where today’s teenagers can access an infinite variety of musical options. They don’t need an adult for a ride to the local record store anymore. 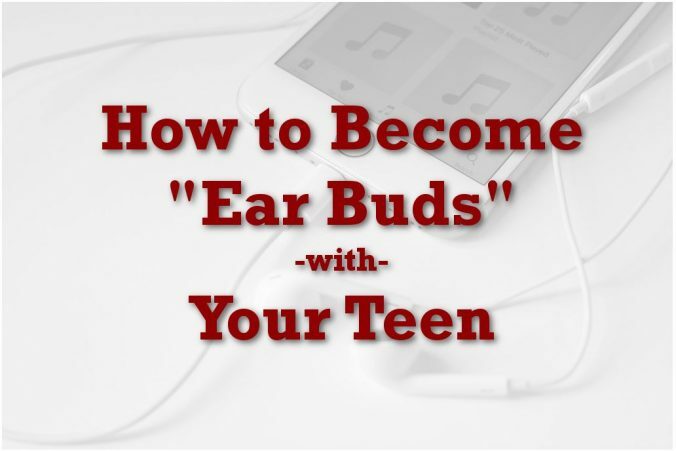 Unless you are proactive, you could have no idea what music your teen is listening to in their headphones and therefore be missing out on a significant opportunity to connect. Step 1: Become part of a digital musical ecosystem as a family. There are a few different ways of doing this, but the end goal is to merge your family’s music collection so everyone has access to everyone else’s music. At that point, there is the potential to stumble upon (and appreciate) another family member’s tunes. iTunes – pick up a USB hard drive (500 Gb – 1Tb will usually be more than enough space) and have everyone copy their digital music to it. Connect the drive to your family’s main computer (read: the one that’s on most of the time) and have iTunes use the drive as its main library destination. Now members of the family can connect using Home Sharing and access the family music library. Spotify – Sharing a Spotify Premium for Family account allows up to six members of a household to keep their own organized Spotify libraries as well as share them with each other. Family members can send each other songs and playlists all while being able to stream their own tunes from the internet or download music to listen to offline. Google Play Music – With a family plan you can upload your entire music library to Google’s servers as a family library and up to six people can access the music anywhere they can get online. Plex Media Server – Taking advantage of Plex’s Multi-User option, you can create a shared digital library similar to Google Play music. The only major difference is the music is either stored locally on a powered-on home computer or on one of Plex’s supported cloud storage providers. As the adult, you need to be conscious of your reactions to your teen’s music. Being overly critical or rigid in your willingness to hear what your teenager is listening to is a surefire way to sabotage the potential for success. Think back to your youth; did your parents’ critiques of your musical taste change what you listened to? Probably not. Remember: music is a deeply personal part of a teenager’s life. Being overly judgmental of a teen’s taste is viewed as being overly judgmental of him or her. This type of effort is pointless if you enter into it with a closed mind. If you’re not willing to take the time to hear where your teen is coming from musically (whether you like the majority of their contributions to the family music library or not), don’t bother. The risk of offending them and creating a painful disconnect is too great. Stay open and stay positive, your teen is worth it! Ultimately, the beauty of this type of connection is it can happen both passively and actively. Family members have the option to delve into the music of others when they are ready and willing to do so on their own devices and in their own spaces. Thus, a family music library has the potential to pass through closed bedroom doors or constantly-worn headphones. Even if your teen isn’t immediately receptive or engaging with the idea of getting onto a musical common-ground, give it time. Merely generating the openness provided by a shared musical library is the hook in the water that may land a big bite with some patience and time. How have you been able to use music to connect with your family? Share your experiences in the comments below for others to try!